There's a strange cold spot in the cosmic microwave background that's puzzled researchers forpast few years. A team of astronomers now say they know what this strange cold spot is, a "supervoid" approximately 1.8 billion light-years across. 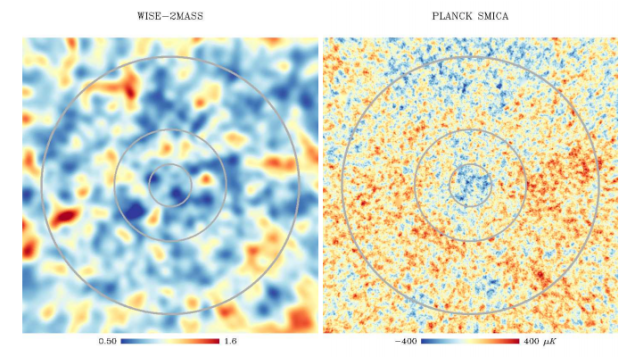 The Cosmic Microwave Background Cold Spot is reflected the utmost important variance perceived by Planck scientists. Descriptions up to date have appealed to unidentified or bizarre physics, like the decaying of gravitational potentials produced by Dark Energy, the outcome of a cosmic texture (a leftover of a stage shift of the initial Universe), an impact with an additional universe, or may be a wrinkle in space-time. Its detection has even defied the inflationary concept of the Universe. But a new theory postulated by István Szapudi at the University of Hawaii in Honolulu and his coworkers proposes something far simpler: This leftover in the afterglow of the Big Bang is just a gigantic hole in the cosmos, a hole known as a cosmological void. These huge spaces, like the 250 million light-year extensive Boötes void, comprise nearly no matter at all. The scientists came to this assumption after examining an all-sky analysis made by NASA's WISE satellite. Called a "supervoid," it's situated about 2.8 billion light-years away, extending some 1.8 billion light-years across, creating it about double the size of the earlier largest known void.